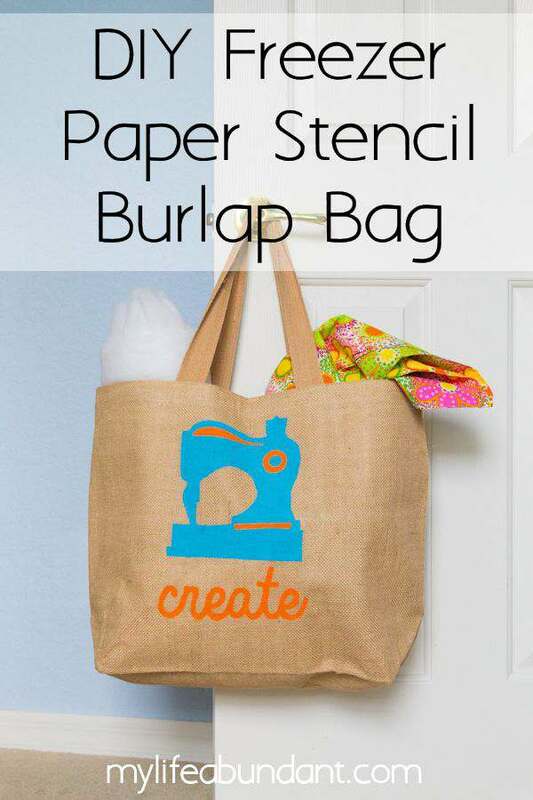 Learn to make a freezer paper stencil with your Silhouette or any cutting machine and make a cute craft burlap bag or a gift for the holidays. I am so excited about my new Silhouette I received for Christmas this year!! I felt like Ralphie when he received his Red Ryder B.B. gun in The Christmas story. But I don’t have to worry about it shooting my eye out! I sat and stared at the unopened box for a few days trying to figure out what to make. So, after hours of cleaning out my office closet, where I also store all my sewing items, I decided I needed to put all my sewing material and other items in something to keep it neatly put away and in one area. I needed a craft bag, but not just any craft bag. A pretty craft bag. First thing I did was look up all the information and videos I could find on how to use my new Silhouette machine. I had no idea what to do first. 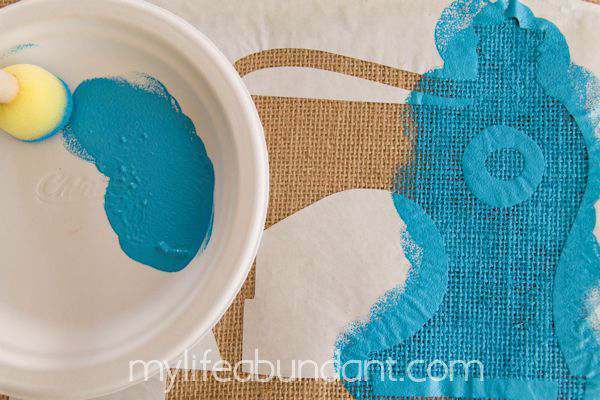 I came across a great website where I learned how to use freezer paper as a stencil. Looked easy enough for my first project. First, let me tell you about this great bag from BurlapFrabic.com. This is the perfect heavy duty bag with nice interior backing and nice handles for my craft bag. And no worries about your paint bleeding through to the other side since the material is so thick with the inside backing. These bags come in so many sizes and I can only imagine all the different projects you can make with them. Now on to the project. I choose a sewing machine design from the Silhouette website and I was wanting to cover as much of the 12 x 12 area as I could since I had a large bag. 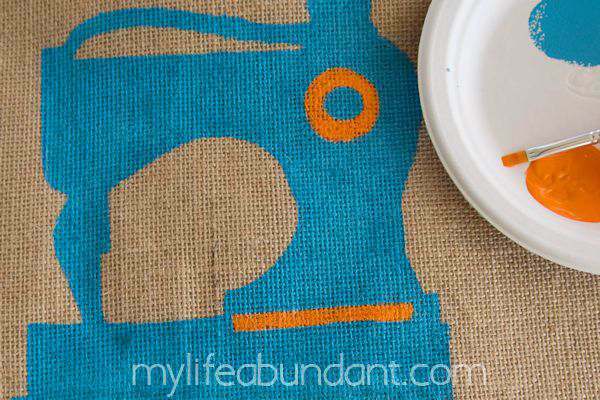 I followed this tutorial to cut the stencil on my freezer paper. Melissa calls this her Silhouette Tutorial for a No Bleed, No-Fail Paint Stencil and she is was so right about that. Remember, this type of stencil is for one-time use, which is great for clean up. Designs are endless using this process. Now here is the tricky part. When you pull your freezer paper off the Silhouette tacky mat, it’s going to curl up really bad. So have your iron hot and ready and I had to play with it quite a bit for placing before I started ironing slowly. If you have a smaller design there probably won’t be this problem. It really does stick well to your material. Remember, to put the shiny side down facing the material. Then I took the strips and the circle and ironed those on next. Make sure your freezer paper is really flat and no gaps before you start painting. Now its time to paint. 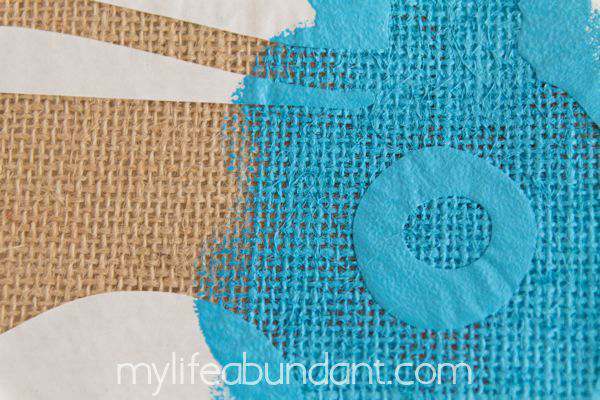 I used a sponge craft dauber brush to tap up and down with paint over the exposed burlap areas. Don’t move your brush side to side or the paint will go under your stencil. I used craft paint and you could also use material craft paint. As you can see it covers quite well. I did put the paint on rather thick since the backing on this bag won’t let paint bleed through. After you are finished painting, pull off all the freezer paper and you now have a sewing machine. I was so impressed with how well this technique works! Next, I took the other color of paint with my flat small brush and hand painted where the stripes and circle freezer paper stencil was. The whole sewing machine could’ve been all the same color, but, I wanted a little more color. I also designed the word “create” in script to use underneath the sewing machine using the same process as above. I just loved how this turned out and now I have a neat way to carry and store all my material and other larger items I use for my sewing machine. When its time to sew, I just grab the bag and my sewing machine and off we go. Even though this was my first project using my Silhouette, it was fun and easy to do. 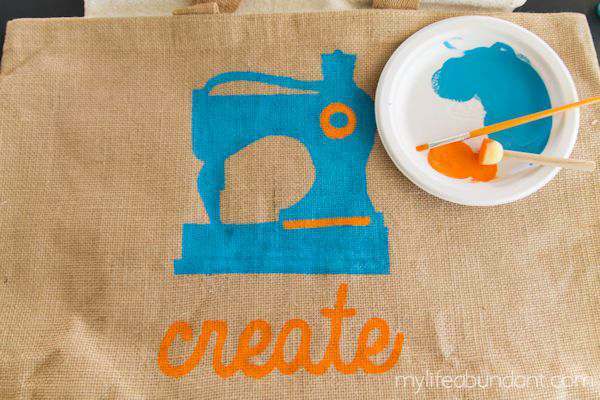 I think making small bags for children and letting them paint on the stencil would be a great way to have fun! 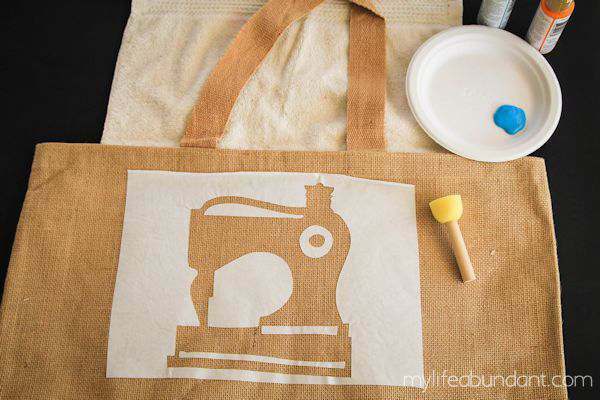 Im all about totes and bags, so I would absolutely love the Juco – Jute & Cotton Blend Tote Bag to craft on! I have so many ideas for it! I’m beginning to love burlap more and more. This bag is just so durable to use for toting so much. I would choose the burlap cushions. We just got a new couch, and it would be fun to change out the accent pillows from time to time. I would really love to make a burlap tree skirt so I would get materials to do that! I’d like to try their banners is a craft: Burlap Banner – 8″ x 10″ Triangle (12 Pack). I would like their tote bags, too. That is simply adorable. I would love to win! Thank you so much for this! Thank you Suzie. And it was just so easy to make. I love the burlap coffee sacks, and I always like having them for projects. We upholstered a turtle footstool with a burlap coffee sack, and I love it. So I would love to have more. That is such a great project! And I would love to use the burlap ribbon! I love the burlap beach bag on the site. These would make great gifts! Hello, I would like to get some of the burlap curtains and dress them up with trip and maybe some paint. Thanks for a great giveaway! I would definitely get the tote bags, I love the bag that you made! It looks so professional, definitely something I would consider buying on Etsy. I would love to use the Linen Stocking with White Cotton Lining. What a cute bag and great idea! Thanks for sharing! Love this- it’s truly adorable! Thanks so much for linking up at Snickerdoodle Sunday! HOW SWEET!!! Thanks for sharing at this week’s Motivational Monday link party! Hope you’ll join us again next week!! Thanks so much for linking up at the Totally Terrific Tuesday Link Party last week. Please come back again this week…we’d love to know what you’ve been up to. The party starts at 10pm. I hope to see you there!